That Don’t Make You Cringe? Go Greenspeed! Your family can be warm and comfortable this winter without breaking the bank, thanks to ultra-efficient, ultra-quiet GreenspeedTM Intelligence technology, now available in the Infinity® 98 gas furnace. The most advanced furnace Carrier® has ever produced, the Infinity® 98 adapts itself in tiny increments to minimize energy use while heating your home to the exact temperature you wish. Most of the time, your new system will use only about 40 percent of its capacity, running slow and steady to maximize efficiency. As the temperature outside changes, the system will gradually ramp up to adapt to exactly what the home needs for heat, or in the case of the heat pump, for cooling, too. As an ENERGY STAR® partner, Carrier has determined that the Infinity 98 gas furnace meets ENERGY STAR® guidelines for energy efficiency. To achieve optimal performance, though, it’s essential that your furnace is properly installed. Joseph Frederick & Sons, a family-owned business for more than 65 years, is one of the area’s few Carrier Authorized Dealers and a four-time recipient of Carrier’s President’s Award for excellence. Joseph Frederick & Sons also has been awarded the BBB Torch and Rush Awards in the past and the Angie’s List Super Service Awards for Heating & Air Conditioning, Plumbing and Water Heaters, an exclusive recognition bestowed annually on approximately 5 percent of all the companies rated on the nation’s leading provider of “consumer reviews” for local service companies. So when you’re ready to go GreenspeedTM, contact Joseph Frederick & Sons at bfrederick@jfrederickandsons.com or 302-994-5786, or visit our website at www.jfrederickandsons.com. Joseph Frederick & Sons has been in business for over 65 years. Our grandfather started this business in 1947 with one truck, a willingness to work hard, and a sense of integrity. 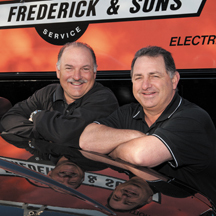 Today, four generations later, we are proud to say that the name Joseph Frederick & Sons means the best in residential and commercial air conditioning, electrical systems, heating, and plumbing. The core values on which our family’s business was first built remain its cornerstone – our sense of integrity, dependability, and quality workmanship has withstood the test of time. Great kitchens and bathrooms are more than just pretty cabinets and nice color combinations. To create a truly great kitchen or bathroom, the plumbing, air flow and electrical planning must be a part of the initial designing process, rather than being shoehorned in at the end. That’s why Joseph Frederick & Sons is the company to call when it’s time to remodel your kitchen or bathroom. With more than 65 years of expertise in heating, cooling, plumbing and electrical services, we work with you every step of the way, from design through installation, so your new kitchen or bathroom will be well-made both inside and out. We work with top-quality suppliers to ensure that you get the very best cabinets, fixtures, and flooring. To set up a free consultation, contact us today. 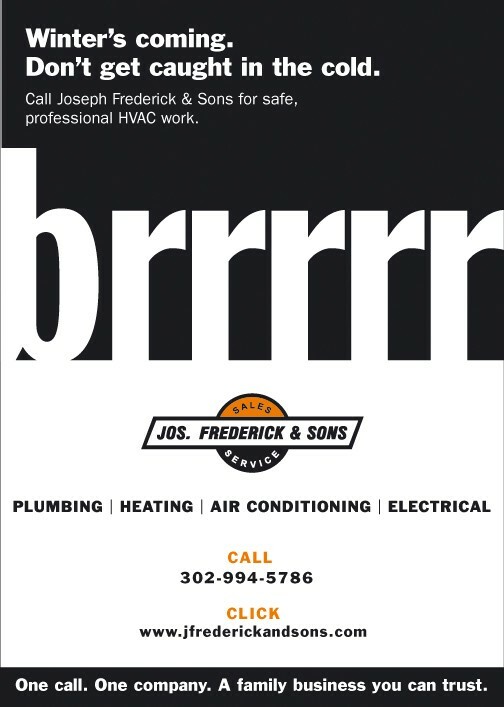 Thank you for considering Joseph Frederick & Sons for your home’s air conditioning, electrical, heating, and plumbing and bath & kitchen remodeling needs. We are located at 810 Stanton Road in the Marshallton area of Wilmington, Delaware. Business hours are 7:30am-4:30pm with 24 emergency service. Visit us today at our website, www.jfrederickandsons.com , check us out on Facebook and Twitter, or contact us at (302) 994-5786. We look forward to serving you!